Has your business suffered from negative reviews online? Wondering how to respond to negative posts that reflect badly on your service or products? In this article, you’ll discover how to respond to unhappy customers on social media and address negative online content. 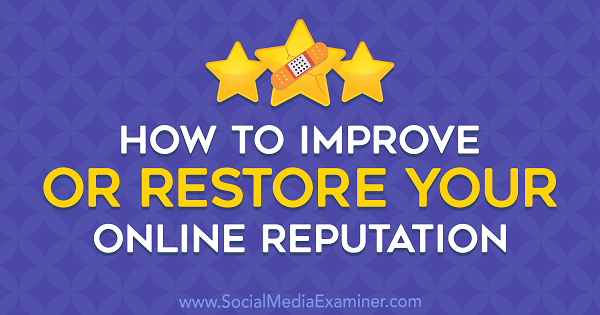 How to Improve or Restore Your Online Reputation by Sameer Somal on Social Media Examiner. Every day, people use the internet to find locations, share stories, write reviews, conduct research, get information, design things, and buy and sell products and services. According to Statista (as of March 2018), 46.1% of people between the ages of 18 and 60 research products online before going to the store to purchase them. A Podium survey found that 93% of consumers are influenced to purchase (or not) by online reviews. WordStream reported that 43% of consumers research online while in-store, and BigCommerce states that 80% of Americans shop online at least once a month. These studies make it clear that what people say about your brand online directly affects your bottom line. Businesses can lose contracts, employees can get fired, and even more importantly, the brand’s reputation can suffer, whether the negative information is true or not. Online reputation impacts profit. And, with our increasing dependence on social media, people are using social platforms to assess your brand’s character and value, often before they purchase. 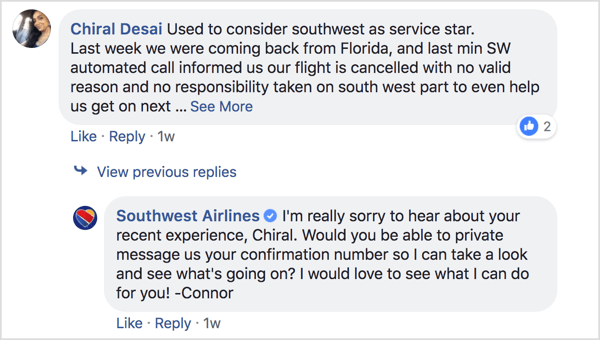 If you address negative reviews and mentions head-on, as Southwest Airlines does below, you can often turn things to your advantage. When a company receives a negative review, the automatic reaction is usually to hit the delete button. But it’s important to recognize negative reviews not only as a threat but also as an opportunity. For instance, you can try to turn a dissatisfied customer into a raving fan. Or use the customer’s insight to improve your customer service experience, product, or service. As long as you receive mostly positive reviews, the odd negative review shows that your business is genuine and credible. Plus, the positive reviews become more meaningful. Potential customers will check how your brand responds to criticism. If you respond well, you get a score in your favor. Respond poorly, and you can probably kiss that potential client goodbye. Of course, there are varying levels of negativity. To illustrate, if a customer submits a negative review, it’s not likely your reputation will be irreparably damaged. But if your CEO is reported to be involved in fraudulent activity, your online reputation could be damaged significantly. Your response should depend on the scale and severity of the damage. A poor review or customer complaint can be carefully addressed and handled in-house, but damage from an unfairly slanted review or unfavorable news story can be addressed proactively via a content strategy. Here’s how to handle both types of negative mentions and restore a damaged online reputation. Before you can address bad reviews or mentions, you have to be aware of them. 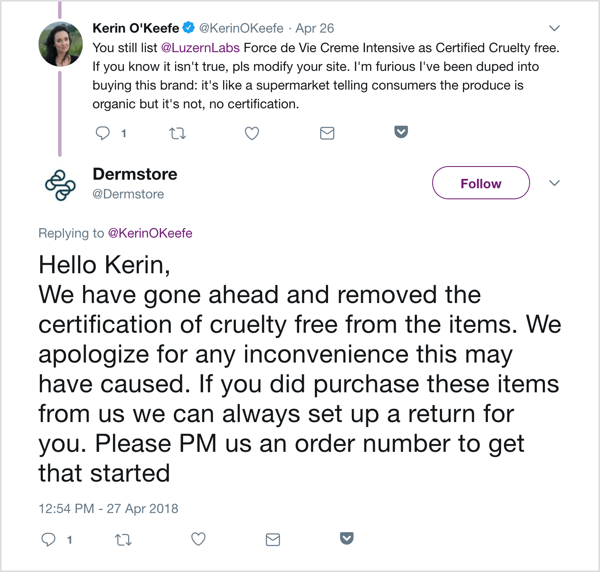 With more customers using online review sites and social media as a channel for complaints, praise, and queries, it’s just about impossible to manually register for and monitor them all. That’s where tools and alerts come in. 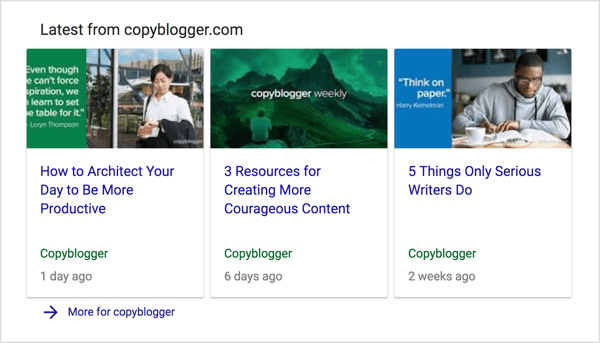 Set up Google Alerts to get notifications of mentions of your brand or any keyword (products and their misspellings) used on the web. It’s quick, free, easy, and effective. Simply enter the search terms you want to be alerted about and decide how often you want to be notified. Every time that search term is used online, Google Alerts will notify you via email. Open an account with Free Review Monitoring to get notified of reviews submitted with all major review sites. The tool analyzes the most popular review sites for the keywords in your company name. Rankur has a free version that can be set up to monitor all mentions across the web, including news sites, blogs, images, videos, and the main social media sites. 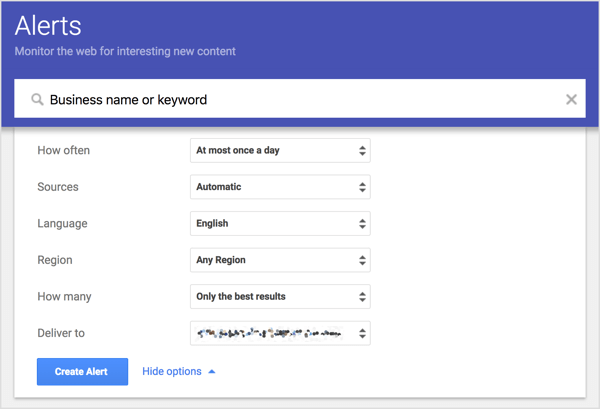 Monitor keywords and brand names. You’ll have to upgrade to the $24/month plan for alerts, though. It’s ideal if you can address and resolve any issue publicly on the channel your customer is using. Transparency shows that you have nothing to hide. If you need to take the conversation off that channel, say to email or private messaging, be sure to update the original thread once resolution has been reached. 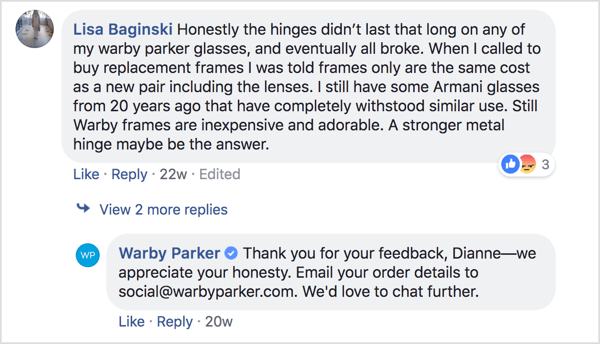 On Facebook, you can respond to reviews via your page or reply to comments directly. For a private exchange, move the conversation to Messenger. On Twitter, you can respond to any tweet with an @reply. For a private exchange, move your conversation to direct message. On Instagram, you can respond to mentions with a comment that contains the customer’s @username. For a private exchange, move your conversation to a direct message. If you get a bad review or mention, it’s usually a symptom that something is wrong. To turn it into something positive, you must first understand the root cause of why it was given. Find out why someone is upset and respond on the channel they used to share their feedback. In this scenario, a sincere “we are sorry, and thank you for your feedback” is most often what the customer is after. This customer wants to see how you respond and what you’re going to do about what they’ve told you. If you do nothing, they aren’t likely to provide feedback again. If you thank them and explain how their feedback will be used, they will walk away satisfied and you’ll have reinforced your good relationship with them. Make sure you respond to the feedback quickly and that the customer is aware of your response. This should not be an automated part of your customer care process. It requires the involvement of a trained person who can thank them for the honest feedback and explain the changes their input is helping you make. When a consumer is disgruntled, they experience intense emotion and feel the need to express it, whether it’s justified or not. They will often take the matter online for practical reasons, with the intention of getting a response from you. 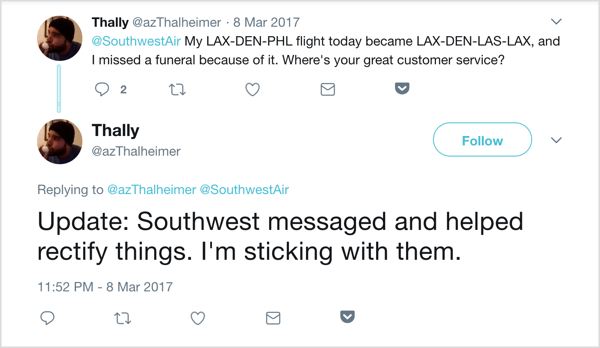 When people have a bad service experience that they have strong feelings about, and the company doesn’t acknowledge those feelings, the consumer will vent somewhere: either by telling friends and family, or perhaps over social media. Both are bad situations for any business to be in and can hurt your online reputation. Ignoring the review or mention is likely to make the matter worse. 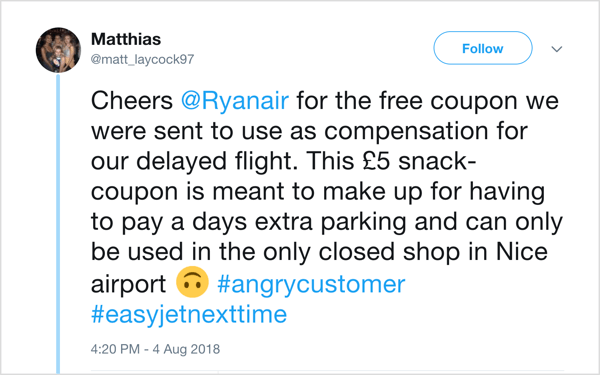 Whether the complaint is justified or not, the customer experienced real frustration with your service and wants you to acknowledge their pain. What the majority of companies don’t understand about angry customers is that with a bit of strategic and creative thought on the brand’s part, intense anger can turn into awed bedazzlement and loyalty for life. Put yourself in your customer’s shoes. If their anger is justified, show them that you accept responsibility and are truly sorry for stirring up their anger. In your response, accept responsibility for the mistake, acknowledge the reviewer’s frustrations, and make apologies. It’s also helpful to address each point. You can flip the bad experience into a redeemed one with an excellent response. After you acknowledge their position, consider providing a free service or product upgrade. 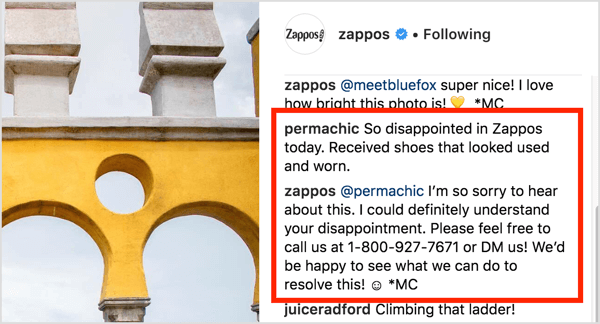 Pro Tip: When considering options to redeem your brand’s reputation, it’s important to consider the cost of replacing the customer and the expected profit from the customer if they stay with you. 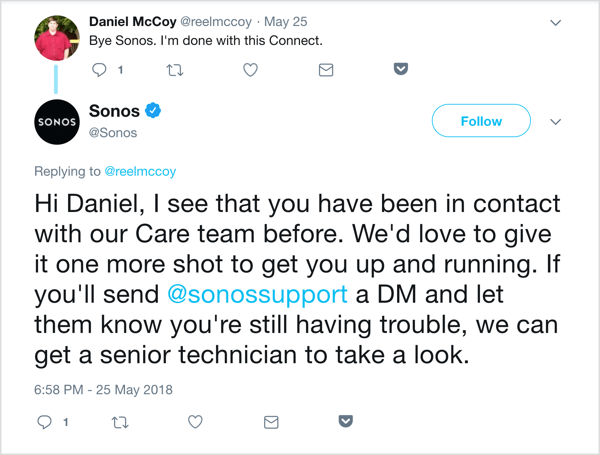 When you give a customer something they consider meaningful, you can be sure they’ll tell their friends and family about their service recovery experience with your brand. Before the internet became enmeshed in our lives, when we experienced poor service, we’d turn to friends and family, telling on average 10 people about it. Over time, those 10 people would spread the news further. Now though, it takes only seconds for people to publish something online that can rip a reputation to shreds while spreading the word to thousands. Product comparison reviews that are presented as genuine and objective but are written by people being paid a commission for selling one of those products aren’t helpful to consumers or your brand. Often, paid affiliates don’t disclose their relationship with the product they represent and write with a slant to ensure the product comes off sounding like the better choice, even if it’s not. As a result, when people search for reviews about your product and read the slanted review, your reputation can take a hit and your product may experience a decrease in sales. A disgruntled employee or competitor uses online channels to spread unfavorable or false claims about your company and to slur your brand’s name. A news article describes a criminal case that involves one of your employees. The employee is exonerated and found not guilty of all criminal charges, but future searches for the employee’s name or your company serve up news articles that highlight the now-dismissed accusations. Handling damaging information like that mentioned above requires a well-thought-out plan. Depending on the severity of the allegations, you can either handle it yourself or hire an advisory consultant or PR firm. If you plan to handle it yourself, you need to invest in quality content that’s been optimized for search. Why? When you have strong, quality content on your website, blog, and social channels, your content will dominate the front results of pages of search results. In this way, you get the best form of control you can, leaving any negative information trailing in the dust of your good content. Produce white papers, guest blog posts, and case studies that reflect your expertise. Publish video testimonials on YouTube, Facebook, and LinkedIn. Create a neutral and accurate Wiki entry. Answer questions on online forums. Being proactive and prepared in the event you come under attack goes a long way toward protecting your online reputation. If you find your existing content isn’t helping to negate any unfavorable mentions, assess your reputation as it is. View the results of your search, social media accounts, and review sites. Look at any negative results and come up with a content plan to address and overcome those mentions. 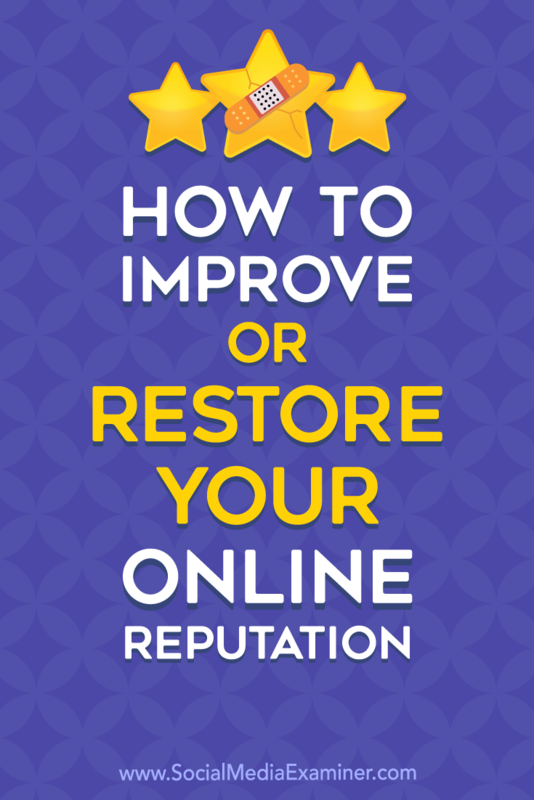 Click here to learn how to assess and manage your online reputation. What do you think? 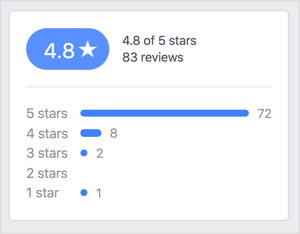 Have you had to address negative reviews online? How have you responded? What other tips can you offer? Share your thoughts in the comments below. Sameer Somal is the Co-Founder & CFO at Blue Ocean Global Technology. A subject matter expert witness and frequent speaker, Sameer helps clients build, monitor and repair their digital presence.